Often when we think about something we are working towards, we unconsciously place that thing, relationship, quality, or experience outside of us, at a distance. When we do this, we, in a sense, place what we desire just out of reach, beyond our ability to experience it- or so we think! We create a separateness- me/it, me/them. Unconsciously (usually), we've distanced ourselves via our beliefs, our imagination, our thought forms, our expectations, and our energetic positioning of what our reality is now and what is possible. Try it. Think about something you’ve been working towards or desiring, and notice what that's like. My hunch is that you are ‘here’, and it is hanging ‘out there’ somehow. If you are visual it may even look like it's 10, 100, 1000 feet away… or it may be a felt sense of distance. So our guidance is to bring it close. If you want a stronger connection with your guides (this is the one I worked with recently), imagine they are close, right next to you... because they are. If you desire clarity on your life purpose, visualize it right here, right now, pulsing within your veins. This is a gentle fine tuning of energy. Its important not to go into a hard Will... this is actually a softening that brings a closeness, intimacy, and greater receptivity and exchange. Specifically right now, this guidance is coming through in regards to our consciousness, our spiritual growth and wholeness. We'll talk about that more, below, in the section on Flow. Flow with the things that are working for you right now. This will help you to move gracefully as you travel your life. 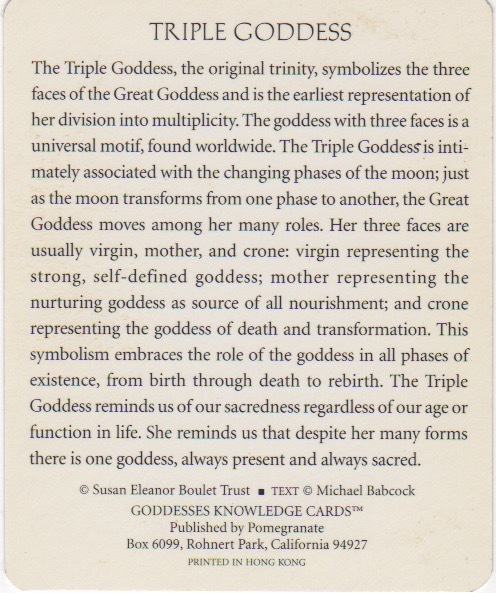 The card pulled for this part of the reading is Triple Goddess. It is speaking to us of flowing through phases of our Self, of our life, and our circumstances. Remember transitions and change are a natural part of living and growing. An image I get for us is of a bright shiny soul part emerging, and the outworn (like an old shell) crumbling and drifting away. Honor the crumbly parts but flow with those things that are pulling this new emergence forward- just keep asking- where is the flow? what are the things, people, experiences, classes, endeavors, relationships, habits… that are nurturing me or supportive of me being my emerging self, and who I want to be in the world? These things really will help pull your emerging Self into your emerging life, like a divine magnet. Are you aware of what is crumbling away or shedding? What is emerging? Awareness helps. Kiss what is shedding away, tenderly, and bring joy and love into the emergence as you give it your fuller attention. Keep coming back to the emergence. Bring your guides, your supports, close- to support where/when/how you are becoming. The emergence is both a growth and a receiving. The card pulled for this part of the reading is Call on Your Joy Guides. Joy is a very beautiful and high vibrational frequency. Simply ask/pray for some personal joy guides to assist you. The Joy frequency doesn't want to be forgotten - it's an important tool, vibration and aspect for & of our emerging self.